Dog wardens from Worcestershire Regulatory Services are appealing for information after members of the public found seven 10-day-old puppies abandoned together with their mother in a secluded area last week. Found huddled together by two walkers away from busy routes by an industrial estate in Hampton Lovett near Kidderminster on Monday May 14, the tiny dogs and their mother have been temporarily housed with an RSPCA foster home but will all require re-homing if they are to have a future. The mother of the seven strong litter is a german shepherd cross, and a 10 month old male bull mastiff cross was also recovered from the scene. The authorities are also appealing for information related to the abandoned dogs. Dog warden for Worcestershire Regulatory Services Pip Singleton said: “It’s heart wrenching to see defenceless young animals abandoned. They were found huddled against the cold with their mother. We are appealing to anyone that might have any information on this to come forward in absolute confidence, because abandonment and causing undue suffering to animals is not just cruel, it’s an offence that we will seek to enforce where possible. 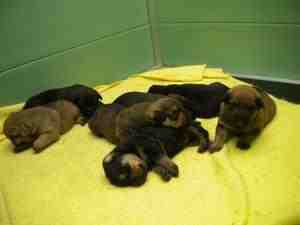 Above: The abandoned puppies will need new homes if they are to have a future. Disabled people could be put into care homes, says County Council. Under new proposals from Worcestershire County Council, some disabled people who are currently active in their communities may be forced into care homes, if this was the cheaper option. In a consultation document, “Maximum Expenditure Policy”, Worcestershire County Council proposes to put a cap on all new applications for adult social care, in an about turn to the Council’s commitment to Independent Living. This capping will also apply to those people who are already established in their communities, if they need to be reassessed. “The consultation process has been poorly publicised,” complained Simon Heng, former chair of the Worcestershire Association of Service Users, “I only found out about the public consultation meeting in Kidderminster Town Hall (on 15 May) four days before it took place. There must be many other people who could be affected, who would have wanted to attend, but were not aware that it was happening” As a result, at the consultation meeting in Kidderminster – one of only three planned open consultations across the county – there were only a handful of members of the public in addition to members and supporters of Wcil. The next open event is at the Wendron Centre, Chapel Street, Bromsgrove at 11 am. on the 28th May. Many of those who did attend expressed a wide variety of concerns, including the fate of informal carers, who may lose their homes if their relatives were forced into residential care and the jobs of personal assistants employed by disabled people currently living independently. Representatives of the county council could not say how many people this proposal might affect, or what the capping limit would be at today’s costs. Even though WCC is aware that another source of funding, the Independent Living Fund, is likely to end in 2015 (which would affect the care budgets of many disabled people) no contingency plans have been made for this. Simon Heng asked “We know the county council has to make tough choices in these times of tight budgets. But how many potholes are going to be filled for £200,000? Is your smoother car ride really worth the freedom of the most vulnerable in our communities? I will be asking my county councillor which way they will be voting on this matter in the autumn, and I urge anyone who is concerned, or who has a relative or neighbour who might be affected, to do the same.” It could be you or yours next!